1. It has just enough groovy style to let you know that 70s-y good times lie ahead but not so much that the room starts spinning. Neon reminders that the thief's way of life might get them snared in a web! Or maybe out-maneuvered by ever-shifting strategies! 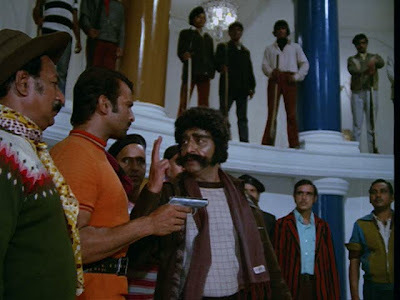 Side note: Pran shares a birthday with three fly fellas from my home state: Abraham Lincoln, Ray Manzarek, and Ajay Naidu (aka Samir from Office Space). Plus Judy Blume, Franco Zeffirelli, and Charles Darwin! Dang! 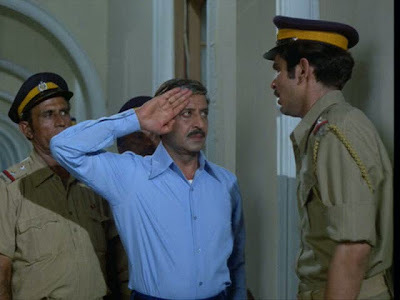 Inspector Kumar outsmarts bad guys by pretending to take a bribe and then clamping the handcuffs down on them as they try to shake his hand. He's upstanding. He's patriotic. He takes self-sacrifice to almost as extreme a cost as a masala character could possibly do - giving up a son surely could only be topped by giving up one's Maa. He's unjustly framed while on a high-stakes mission! And is proud of his own son for arresting him even though he's innocent: duty before family, after all! 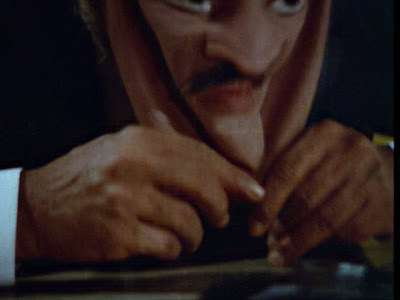 He even mutton-chops his way into the villain's HQ in hot pursuit. makes space for twice the usual distribution of weapons and posse. Wild sweater and neckerchief combo=good. Belted tunic top=good. Striped jackets=good. 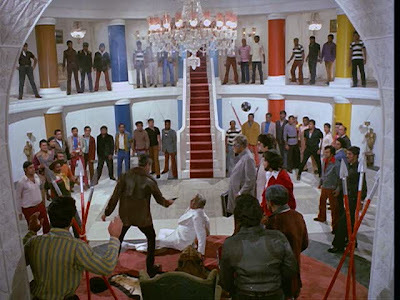 There's something Cake Wrecks about this place (most 60s and 70s filmi interiors that are supposed to read as impressive in some way or other remind me of cakes, actually), perhaps because none of its elements really coordinate with each other. 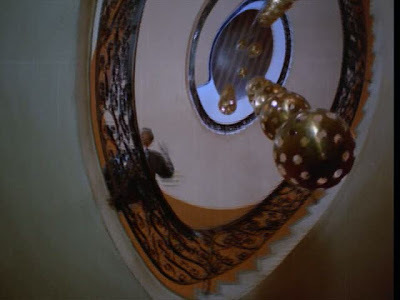 And doesn't that stairway look really narrow? How can you carry crates of smuggled goods on that thing? I wish I had that for Halloween tomorrow. 5. 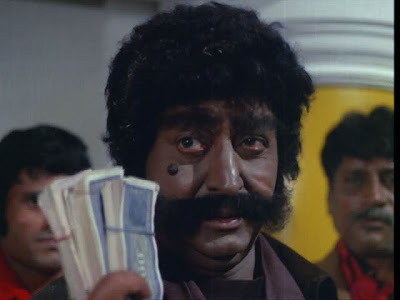 Dadamoni in a silly wig as a drunk, literary master chor (Shankar) with a heart of gold! He enters the story by being in the right place - a hammock, as it happens - at the right time. 6. 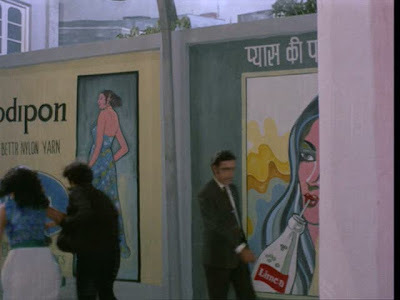 A heroine who does stuff (Zeenat Aman as petty thief Sharmili) and is funny! While rocking a piece of rickrack! Her useful activities include stealing, reading (the hero is illiterate), melodramatically pretending to get hit by a car and die, and making ghost noises. 7. 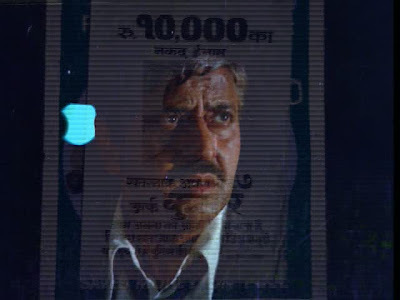 A mysterious high-stakes burglar who leaves a calling card even more enigmatic than Dhoom 2's letter A: 7. Just 7. If Prince were a thief, this is what he would do. 8. 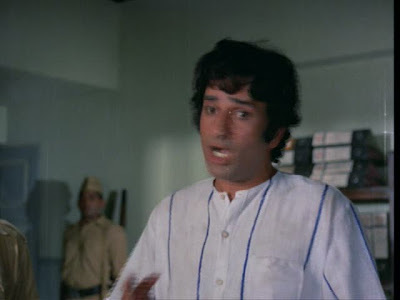 Oh yeah, and this guy as another good-natured pickpocket (Bholanath). 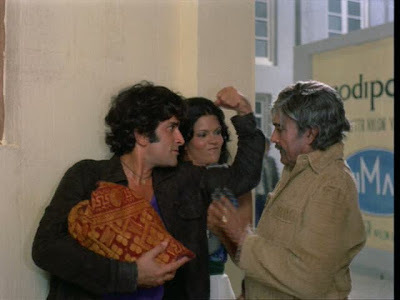 Hate to break it to you, but I don't think you're going to be able to get any tickets for the gun show, Shashi. and playing his patented emotional attyaachaar both straight and overblown in one of the crooks' schemes. Yes, alllll of these pictures are completely necessary to my point. 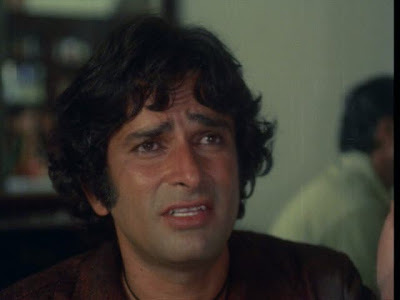 Of particular joy to Shashi fans is the high-energy stretch of about eight minutes from Sharmili's car accident through her burial, when his constant wailing, flailing, chattering, and on-the-fly scheming never slow down and are absolutely priceless. 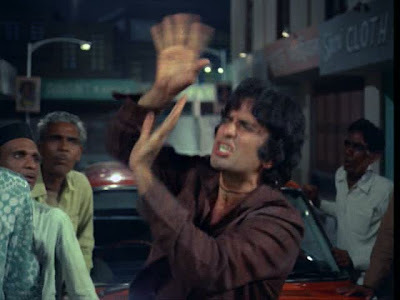 This is probably not the kind of performance that was remembered when he won his lifetime achievement award at the Mumbai Film Festival yesterday, but it should be. 9. Numbers 5, 6, and 8 combine to make an unexpectedly hilarious comic team. 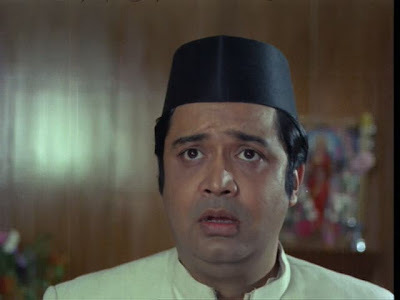 Equally good is the combination of Zeenat, Shashi, and Deven Verma (Parveen Chandra Shah) as the man whom they trick into thinking he hit Sharmili with his car. 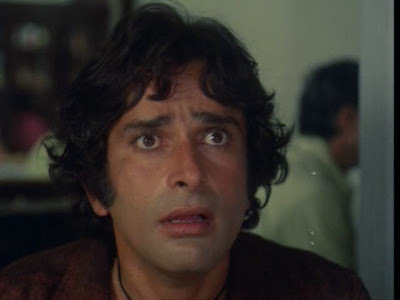 I don't know where this magic comes from; the Zeenat/Shashi pairing in Satyam Shivam Sundaram and Roti Kapada aur Makaan certainly didn't hint at comic genius. 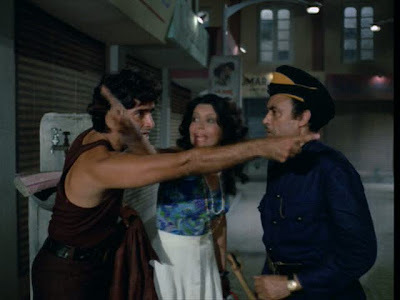 But Chori Mera Kaam is a good ol' masala romp, and everyone (with the possible exception of Raza Murad as Pran's police officer son) seems to be in it for that precise purpose and accordingly has a grand time. 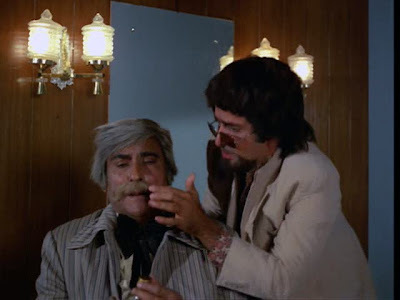 Shashi Kapoor as Keith Moon helping Ashok Kumar as Colonel Sanders (disguise titles courtesy of Post-Punk Cinema Club) with his fake mustache? Comedy gold! 10. 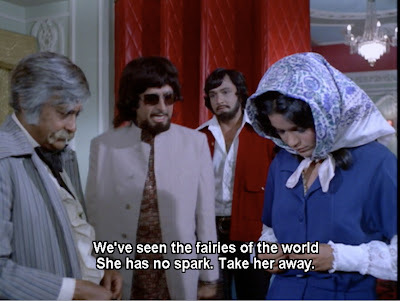 A brief but jaw-dropping pairing of literal and as-filmi-as-they-come tumbles into an already funny romantic spat duet. As Bhola Nath and Sharmili sing about their hearts, he presents her with his. Yes. An actual (or very realistic, anyway) piece of flesh that beats in her hand. She chucks it into the ocean and he runs into the surf to retrieve it, then tucks it back inside his shirt. Bwahaha! In all the zillions of songs we've heard about heroines and heroes and their dils, have we ever seen that? Yeah yeah, Kal Ho Na Ho has its weepy heart patient who won't risk love, but this is so much crisper and funnier. How droll! And it just gets better! 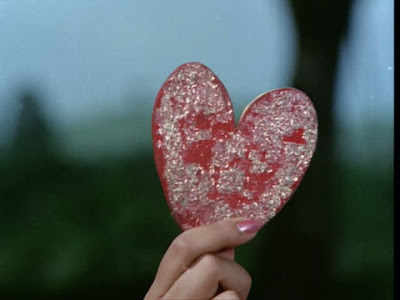 In the next verse, Sharmili shows Bhola Nath her heart, a gleeful hand-made valentine drenched in glitter. Remember when we gave each other hearts like this? Awwww. But she throws it into the air before he can take it from her, and as he runs after it, blinking into the sky, exactly as you would a pop fly, the villains run up, put a coat over his head, and bundle him into a car! Nahiiiiin! 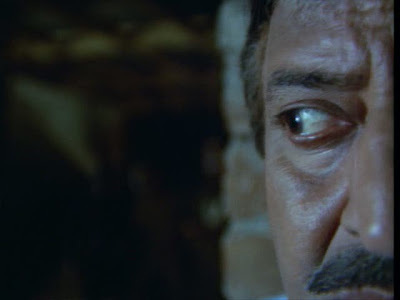 In the next scene, their collaborator Shankar mutters worries about his heart's health in order to gather essential information from the villains. Commentary, perhaps, that the only heart - that is, love - that is truly useful is the one that comes from within you, and if you're using your heart/love as a prop or a toy or a joke, it has no actual use or value? A masala-appropriate message, to be sure. Dil, dil, everywhere a dil! And one of them even squishes - literally! 11. Another clever segue: mourning parents mark the (freakishly manic-looking) photo of the aforementioned sacrificed son, then the camera shows that son, all grown up but still not able to read and write, using his thumb to sign his name. 12. 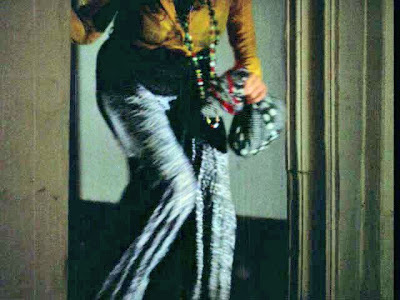 While I would not recommend anyone rent this just to see what the wardrobe department got up to (as I grudgingly might for, say, Khoon Pasina), there are some noteworthy items. 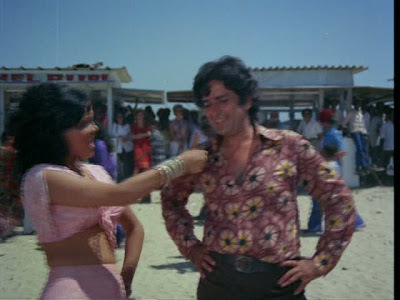 As usual for the 70s, Shashi reinforces his candidacy for king of the superfly button-up shirt, Zeenat has some humongous bell bottoms, and a tiny side character reporter has intricately braided hair that previously I've only seen on Helen. I hope you recognize this shirt. I know SRK, Priyanka, and Amitabh do. 13. Underestimation of the year, even if she is wearing a 1950s Christmas tree drum majorette outfit. 14. The all-hands-on-deck brawl in the climax - of course there's an all-hands-on-deck brawl in the climax! 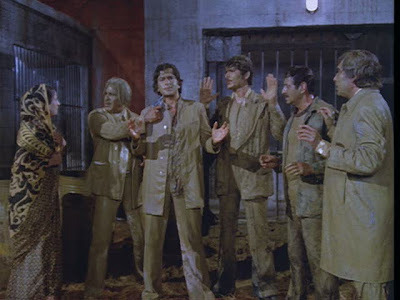 - takes place in so much mud that all the characters end up covered in it. I don't know if this was intended to be funny, but that's how it played out to me. In addition to sheets of rain, charging horses, a tiger, torches, and heaps of barrels, Bholanath and Shankar join forces to knock down bad guys with the classic one-two combination of detective work - throwing a bucket of water on people's faces to see whether they're villains or good guys - and punch in the gut (if they're villains). 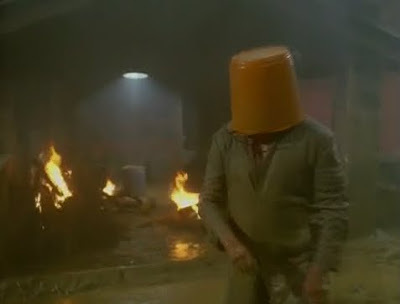 Shankar then puts the empty bucket on his head, and when a bad guy pulls it off to see who he is, Shankar clocks him in the face. 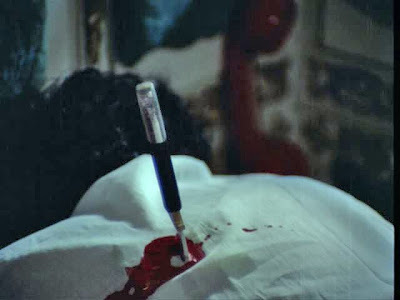 Bholanath also gets in a good trick against the head villain. He bends down to touch bad guy's feet, then grabs his hand and lower legs and slings him into a puddle. Hee! Delicious in its irreverent spin on the respected elder/feisty young man interaction we've seen so many times. 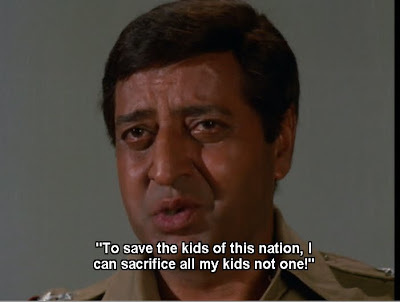 Just one of several little topsy-turvies in Chori Mera Kaam. 15. 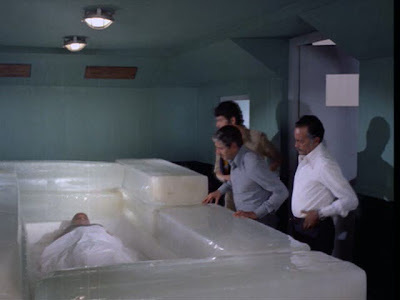 A brief and superfluous scene of an injured Shetty being kept on ice is probably just an excuse for someone in the set crew to see if they could replicate a giant block of ice. Well done! 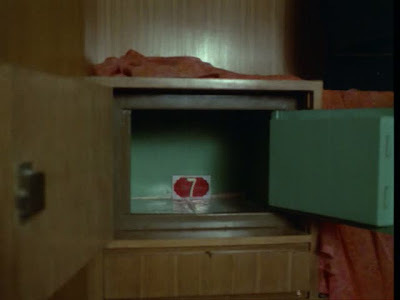 Part of me hopes that this was part of a slightly larger or more significant story arc that was cut, but part of me is delighted to think of it as a one-off giant icy coffin bed for Shetty. 16. Medical miracle: blood flows starting about a centimeter away from the wound. 17. 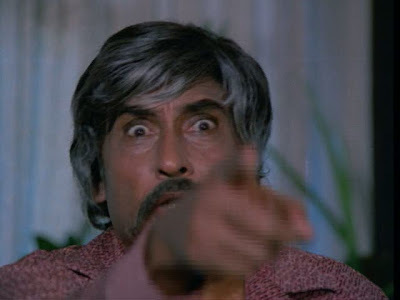 I'm sure many of you experience 70s masala déjà vu (déjà dekh? 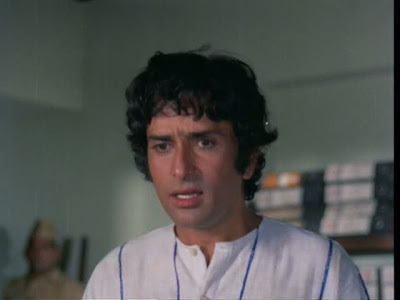 ), not just with plot elements or character actors like Yunus Parvez but with places as well. Chori Mera Kaam reminded me of Shankar Dada a few times: the graphics during the titles, Pran as an honest police officer suffering serious injustice to his own character and career and who gets a song while he's in disguise as someone else, Shashi as a less than sterling character with a cute relationship with Ashok Kumar...and my favorite staircase! I must find out where this is! The villain's HQ was familiar to me too. 18. All sorts of cool movie posters and advertisements in the cityscape backgrounds. 19. 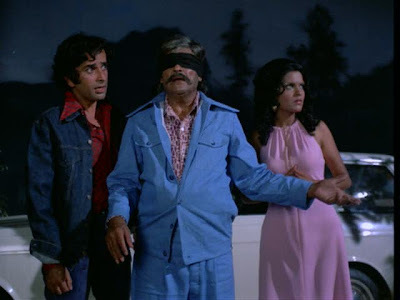 The arc of the entanglement of Bholanath, Sharmili, Shankar, and Parveen Chandra Singh hinges on the first three blackmailing the latter based on an evil deed he thinks he did (but in fact they set up in one of their cons). 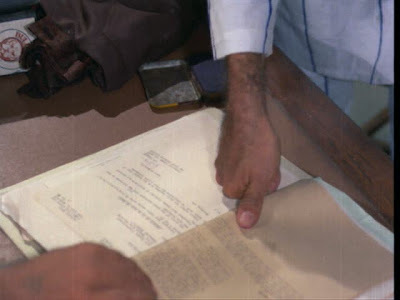 The deed in question is conjured up repeatedly by various characters having great fun with dramatic and threatening re-statement of its key components. "Borivali...ruins...girl...hanging!" 20. Even with all of these things - and more! - to contend with, the movie never loses its way. The pacing varies a bit, but it keeps chugging right along through its almost three hours. With only four songs, that's no small feat, and I spent a significant portion of that time giggling. 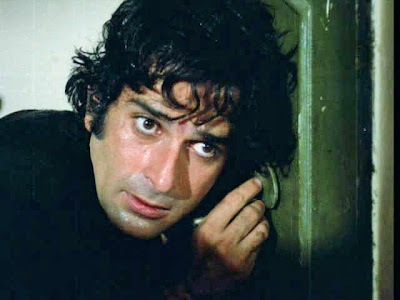 The fact that Shashi doesn't appear until #8 on my list should tell you how good all the other aspects of this film are. 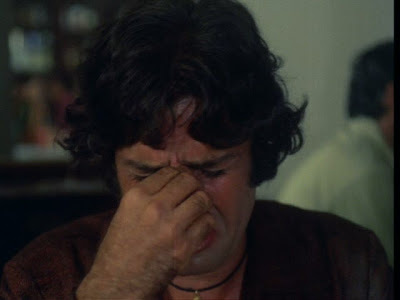 Chori Mera Kaam is not as message-heavy as other 70s fare - it has some family reunion, redemption of small-scale criminals, and subtle(-ish) commentary on life's challenges for those who grow up under-resourced - but I didn't miss that aspect of the classic formula. With so much humor, five strong lead performances, two great songs, and touches of unexpected cleverness, it's a treat just the way it is. OMGG it looks like I'll have to watch this just to get my Dadamoni fix! 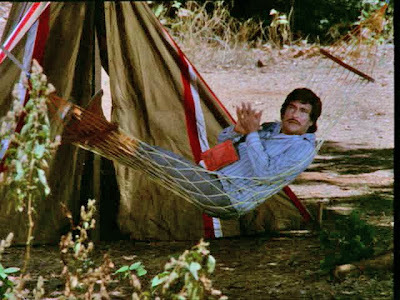 With that hilarious wig and a hammock is always seen in the right place at the right time! 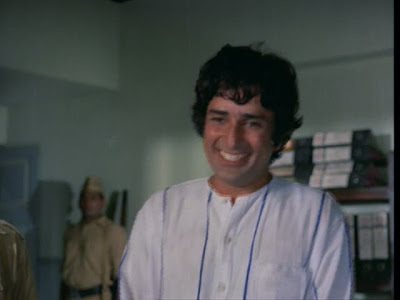 And the crazy fancy dress getups look fab, Shashi as Keith Moon! But what got me the most was the villain's den! Its like the den in Rocky Horror Picture Show! Also the whole gang is muddy, but the maa in the picture also looks muddy with that awful coloured saree! Speaking of movies that fully exploit the awesomeness of Pran and Ashok Kumar, I presume you've seen Victoria no. 203? Tres fun! I adore the tiny mansion. I adored this film too...and Vah! on getting your mom to say "PRAN!" ---as we all should. Clearly, I need to see this film. 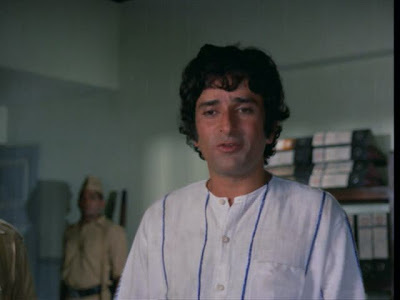 Dada Mani was definitely the best thing about this film (yes, Shashi comes a bit lower for me too, here!). And I second Shalini's Victoria No. 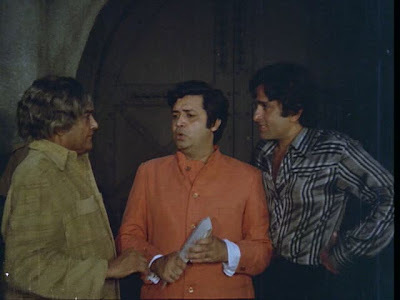 203 rec - Ashok Kumar + Pran = awesome funfest. I'm running to the movie store to purchase this now!!! My god, if anything can get a contemporary viewer like myself hooked on 70's comedy this has got to be it. Running....right....now! 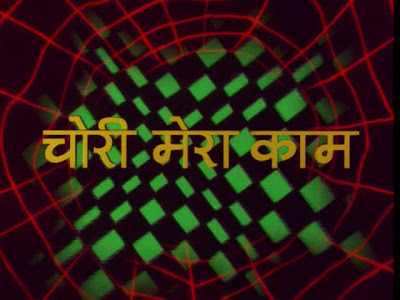 I really should have just called this "Twenty things I love about Chori Mera Kaam" but I honestly do think this movie is superb. It's just so much fun! Rum - Yes yes! Ashok is wonderful! I had no idea he could be so funny! 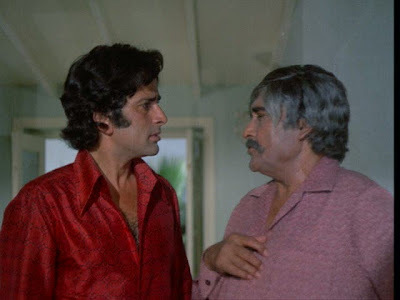 And when he and Pran join forces in the end - look out! Shalini - I really loved it. Maybe I was just in the right mood, but I thought it was many different kinds and levels of humorous and never so much that it skidded into manic wackadoo. I have not seen Victoria no. 203 but its poster is featured a few times in this film so I had just looked it up - and added it to the list! 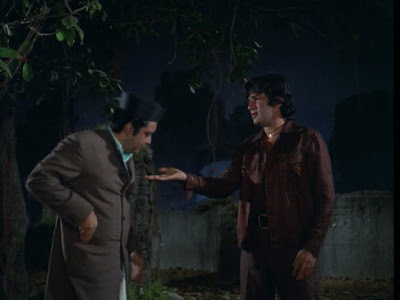 Memsaab - There is no end of Pran awesomeness in this! Probably my new favorite Pran performance. Katherine - You do! Oh yeah, I remember rickrack well. I was just surprised to see it showing up on someone who was supposed to be sort of glamorous (though financially challenged). Especially as a NECKLACE. Bollyviewer - How is that? 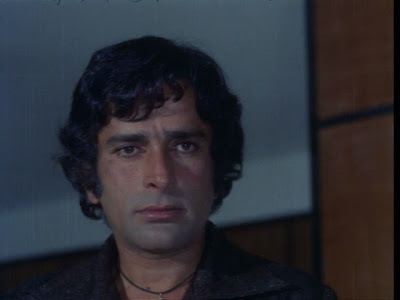 But yes, Shashi is really not the best thing, though he is very very good. Another testament to his ability and willingness to let others shine around him. Ensemble zindabad! shell - YAY! I hope you like it! Parvarish is my other go-to 70s recommendation but sadly a few people who have seen it on my recommendation didn't loooooove it like I do, so I'm a bit hesitant to hype it too much.